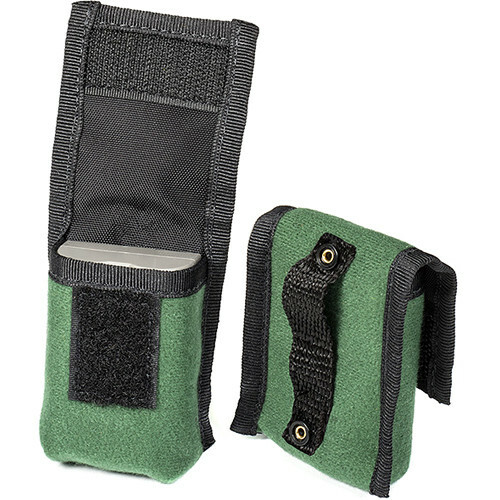 The green BatteryPouch DSLR 1+1 from LensCoat consists of two pouches that each hold one lithium-ion battery. Both pouches snap together to hold the batteries for easy storage and retrieval. Each pouch seals with a touch fastener. When not utilized, they fold flat for storage within your gear bag or luggage. Box Dimensions (LxWxH) 6.1 x 4.1 x 1.3"
BatteryPouch DSLR 1+1 (2-Pack, Green) is rated 4.6 out of 5 by 82. Rated 5 out of 5 by kev c. from Batteries are expensive If you shoot with several bodies and grips, you'll quickly learn that having a back up set of batteries is a good idea. I have 12 Canon LP-E6N, for example. Now it's easy to find a compartment in your bag to chunk a bunch of batteries, but that could be foolish, and costly. These pouches come in two packs, and snap together, back-to-back. There is also a model which is two side-beside- pouches (also two pack), which also snap back to back. Both are terrific! It was easy to find a larger pouch to accommodate my individual battery pouches, and in doing so, I found that I can place all of them in below a short zoom. Rated 5 out of 5 by Mike526 from Perfect fit for Canon LP-E6 battery It is arguably a bit pricey for what it is, but if you want some sort of pouches to store your batteries in, I recommend this well-designed item. As for size, I can give this tip for Canon users: the battery pouch is exactly the right size and shape for a Canon LP-E6 battery -- the kind used in the 5D, 6D, 7D, and others. The battery fits in precisely, with no room to spare, so you can't even use the little plastic back that comes with the battery. But since this pouch protects the battery terminals from shorting out, and doesn't leave room for the battery to be flopping around, I guess you don't really need to snap that plastic on anyway. This item includes two pouches joined together by snaps - you can leave them joined, or unsnap them if you want to use them separately. The pouch is mostly black, but the bright yellow trim is a nice touch because it makes it easier to find the pouch in your camera bag. Rated 3 out of 5 by Burke from Cheap look, cheap build, cheap price I guess you get what you pay for? Way better than using a Hefty bag, but the flimsy look and feel of this item do not instill confidence that they will hold together for the life of the battery (overall life, not per-charge). However, the pouches do isolate the batteries from other items being carried at not too great a cost, and therefore can be recommended. Each pouch holds a battery (so the electrical contacts are covered) and their brightly colored piping makes them visible in your camera bag. Two in the pack means you have enough pouches for both spares if using a vertical battery grip that holds two batteries. Although each has a belt loop, I'd put them in a pocket rather than wear them on a belt -- more likely to still be there when you need the batteries. Rated 5 out of 5 by GDave from Excellent option for DSLR batteries After I washed a battery with my jacket, I needed a better option than just using my jacket pockets to keep my batteries during a shoot. I found this little nugget of an idea and it's worked great! The two pouches can snap back to back around any strap, so I keep them on my bag. If you need to go with less gear, you can slip them on your belt as each has it's own belt loop on back. They're the perfect size to hold the LP-E6 batteries I use, or you can even use them for AA or AAA batteries inserted vertically. The velcro is easy to access with one hand, so battery changes are quick and easy. Rated 5 out of 5 by Paul G. from Spare Battery Case I bought this to carry my spare batteries. My batteries fit perfectly and now I know immediately where they are in my bag. Rated 5 out of 5 by Bernard E. from I have purchassed several of these battery protectors... I buy these covers to protect my rechargeable batteries in my camera bags. I use the AA size to keep the rechargeable sets together. In the pouch, I keep the charged batteries negative side up, and the spent batteries positive side up to keep track of them. When I get back, I know which sets need to charger. Can this hold /fit the batteries for the Nikon D90? Can this fit the Nikon D90 battery? Will this work for a Nikon D300 battery and a Nikon D7200 battery? If so, will I still be able to use the clear plastic cover that came with the battery to protect the connective metal on the battery and still fit easily in this pouch? Sorry, I only have a Canon EOS T5 and the protective cover does NOT fit in this pouch. I keep the battery facing up only for the day I am using the camera, otherwise I do store the batteries with the protective plastic shield on them. Unfortunately it does not fit my battery but I'm assuming the batter compartment is fairly close to the Canon. I lost the plastic battery cover that came with the battery. Is this a good replacement for it? It's for a Panasonic DMW-BLC12 rechargeable lithium-ion battery. The short answer is 'I don't know '. I'm not familiar with the physical size of the battery you have, but the case is perfect for the batteries for my Nikon 3200.